A very simple yet very deep piece of filmmaking. 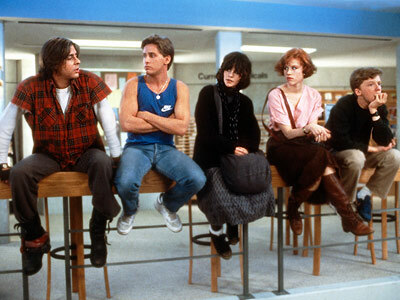 The Breakfast Club is the story of 5 different teenagers, all from different stereotypes: jock, prom queen, geek, rebel and outcast. They all meet at 7am on a Saturday for detention, as time passes they all begin to realise that they are all very similar than they think, all coming very different but very similar domestic lifestyles; with parents as an issue constantly pressuring them in assorted ways (like the jock not having independence, the rebel being a victim of domestic violence etc.) which is quite shocking. It seems as though high school is their place to escape from all the hardship of troubled family life, their place where they actually have people to trust and rely on, a place to hide their secrets. Because of this detention they all have to do for committing serious offences, something happens, they all embrace their troubles by actually opening up and accepting each other, ignoring their stereotypes. All and all, this is a fantastic film, which really emphasises the importance of being yourself and friendship, each actor giving a beautiful performance. This is probably the best film I’ve seen directed by Hughes. A hilarious script, a brilliant soundtrack (especially from the great Simple Minds!) and most importantly: A heart. Hughes really is a genius in presenting the good and bad times of being a teenager; what more do you want? The best ’80s teen movie!